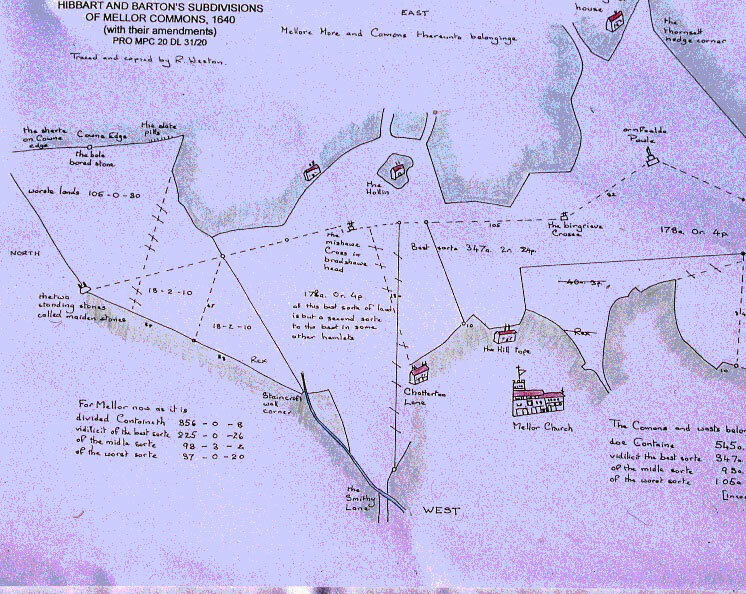 The following notes are taken from talks given by Ron Weston and a fuller account can be found within his book published by and available from the New Mills History Society . 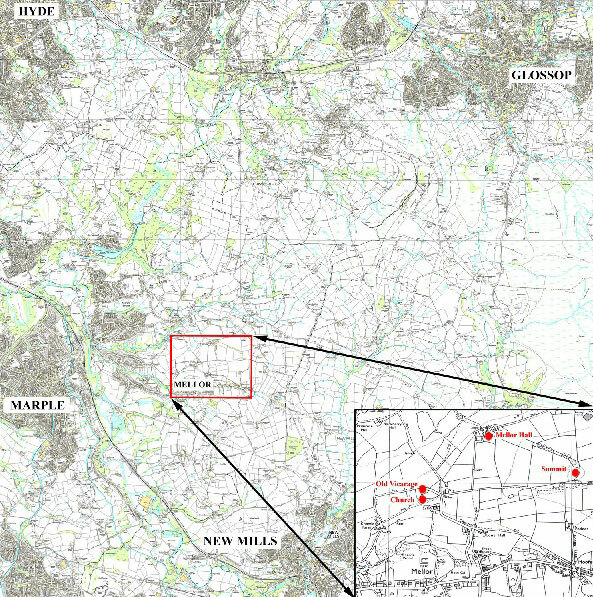 Making use of early maps, documents, published historical sources and field observations during 2004-2005, the landscape of Mellor is described in terms of what has influenced the picture of settlement within the area and how have these developments themselves influenced the way the area looks today. The Hamlet lies on a moderately steep sided west facing slope, approximately 10km to SE of centre of Stockport, comprising the valley side of River Goyt. The Goyt itself meanders low across an appreciable flood plain. Short tributary streams feeding Goyt follow steep courses through deeply eroded narrow V shaped valleys known as Cloughs. 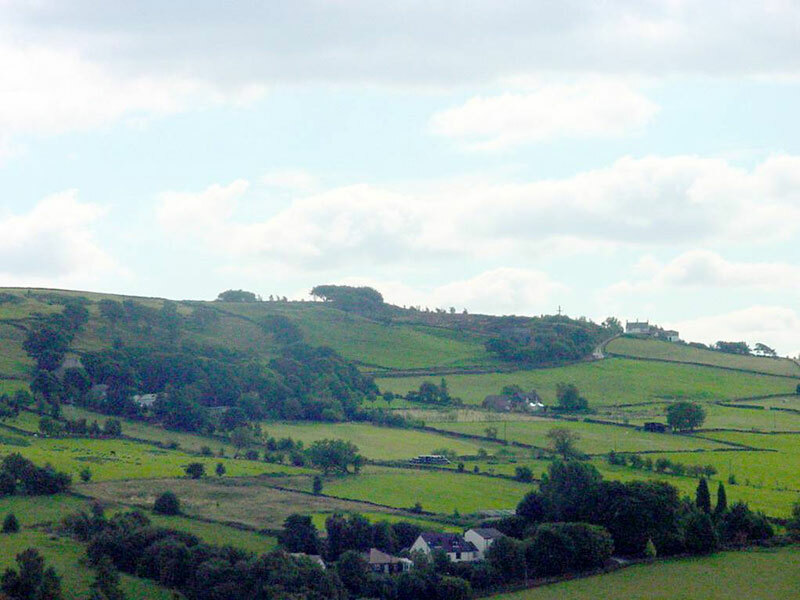 It was part of the County of Derbyshire until 1936 and shares more of the physical characteristics of its neighbour the Dark Peak, rather than the County of Cheshire, in which it now lies. Two sandstones known as Rough Rock and Woodhead Hill Rock form the summits occupied by the upper slope of Cobden Edge and the Mellor Hilltop. There are also Lower Coal Measures throughout the Parish but most are deeply buried beneath the layer of glacial boulder clay, sand and gravel left behind after the last Ice Age. The fact that all of these have been used as a resource by the inhabitants of the area is evident from the disused quarries, abandoned coal mines and associated spoilheaps, which are minor but distinguishable feature of the upland landscape of Mellor. The Mellor Hilltop site still has many advantages. The spine of upland running east to west across the hamlet between Mill Brow Valley and Mellor Brook Valley is one of the few areas where the solid rocks are not hidden by the cover of boulder clay. At centre of this spine is a roughly oval hill mass with gently curving summit and a readily available source of water from several springs issuing from base of sandstone. Despite the elevation of 700-900 feet, the hilltop offered good agricultural land, of light free draining soils on the sandstone outcrop, together with some reasonably flat land and gentle slopes. In addition, the steep scarp around the junction of the Woodhead Hill Rock with the Lower Coal Measures provided a defensive feature. Most of the farms in the area are still small, with areas of cultivated land and hay meadows which have been hard won over centuries from land only marginally better than the Domesday Book described. The location of the better farms was chosen to take advantage of the hard coarse grained sandstones which offered light well drained soils in an area generally characterised by heavy clays. They also required a water supply and a line of Springlines occur at the junction of the permeable sandstones with impermeable clay rocks. The sandstones provided a valuable source of building stone and the Rough Rock measures, comprised of thin beds, provided flagging for roofing and paving, which give the farms their characteristic appearance. 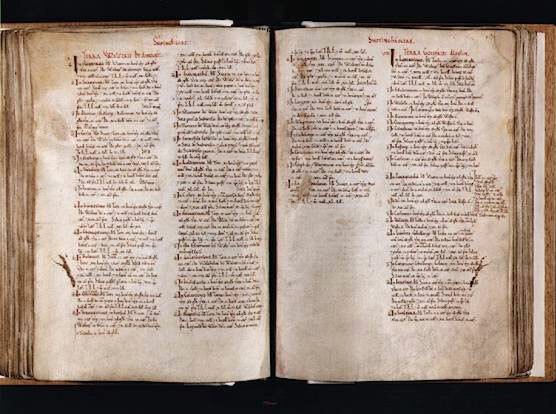 The unpastured woodland fit for hunting recorded in the Domesday Book of 1086 became the Forest of the Peak and was held by the Duchy of Lancaster. It was the gradual clearance and enclosure of this land for farming which has influenced the appearance of the landscape, with its pattern of fields and dry stone walls, which we see today. Lords of Manors were the chief instigators of Land improvement and during the 13th century in particular there was a period of economic growth and expansion which resulted in a phase of woodland clearance, house building and land taking by assarting throughout forest of Peak. When the Lord of the Manor needed to create new farm for relative or valued retainer he would allow a ring fence to be laid out around a suitable piece of land on the common, which would be surrounded by a ditch and bank with a hedge. The curving boundary of Birchenough probably dates from this 13th century process of Assarting, in this case carried out in a process of possibly four phases. Within this boundary small closes would be made for holding livestock and growing crops but much of the land would remain as wood pasture with scattered pollarded trees. People and animals moving across commons would have to skirt the edges of any new boundaries which is why present day lanes and paths sometimes define perimeters of these ancient settlements. Sometimes the Assarts were created legally and at others they were done illegally and fined. The Dark Peak soils, being heavier and wetter are more suited to pastoral farming than arable. Even so, it would have been difficult to make a living from a scattered farmstead without the availability of Common Land. Maintenance of productivity depended on moving livestock off farmland and onto commons during the growing season. 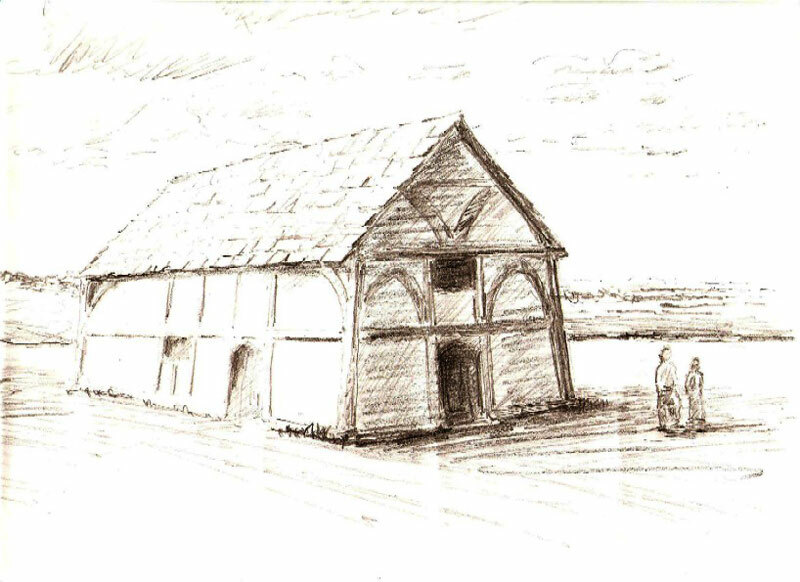 Farmhouses were situated near the edges of their enclosed land not in the centres, reflecting the crucial importance of intercommoning to the farming economy in early times. Then only after the corn and hay were harvested was the livestock gathered off the moors and returned to the fields. The arable fields benefitted over winter from the animal manure. Hardy flocks of sheep were bred which could survive on the coarse vegetation. Intercommoning flocks were not confined by boundaries but moved around through the summer season. The wool from these flocks was the raw material of domestic textile industry. 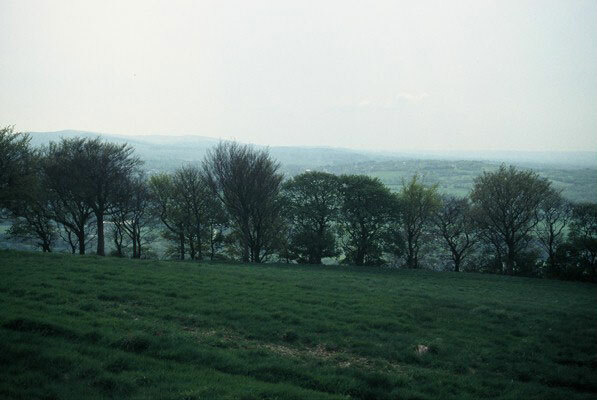 Some of the higher, steeper and wetter parts of the commons defied improvement until present day in areas on Cobden edge and Ludworth Moor, leaving a good idea of their former composition and appearance. There were no fields or boundaries except for those along the moorland edges and these were more likely to be hedgerows rather than walls. The principal ways onto the Commons were long strips of common land projecting called Horns, which were frequently gated, making it easier to gather the livestock off the commons. The horn leading into Moorend had a Pinfold where animals found to be in the wrong flock could be left to be collected by the rightful owner. Some farms with land adjoining the commons had their own gates onto the moors. Woods were preserved and managed even on those farms created by clearance of woodland as it was a valuable source of timber and fuel. Woodland clothed the deeper cloughs and even small streams were lined with thinly scattered trees. We know that farmers were often skilled woodworkers, turners and carvers as Treen Ware features prominently in 16th and 17th century probate inventories as items of value. Ancient Woodlands in the Dark Peak can be recognised by their species: Oakwood; Wood Millet; Wood Vetch; Yellow Archangel; Woodruff; Hairy Woodrush; Wood Anemone; Goldilocks Buttercup; Bluebell and Dogs Mercury are all indicative of past woodland sites when they occur in grasslands. Hedgerows can be dated by the species count, the older the hedge the more species it is likely to contain. These will include: Hawthorn; Holly; Blackthorn; Hazel; Elder; Rose; Ash; Oak; Horse Chestnut; Sycamore and Birch. The species count in vicinity of Lower Cliff and Greenough Farm for example indicate a late 15th century early 16th century date for the hedges. The existing Mellor Hall has a Date stone inscribed 1691 and the earliest recorded date given in Cameron 1670. We knew, however, that a earlier Hall at Mellor had been mentioned in records of the late 14th century. 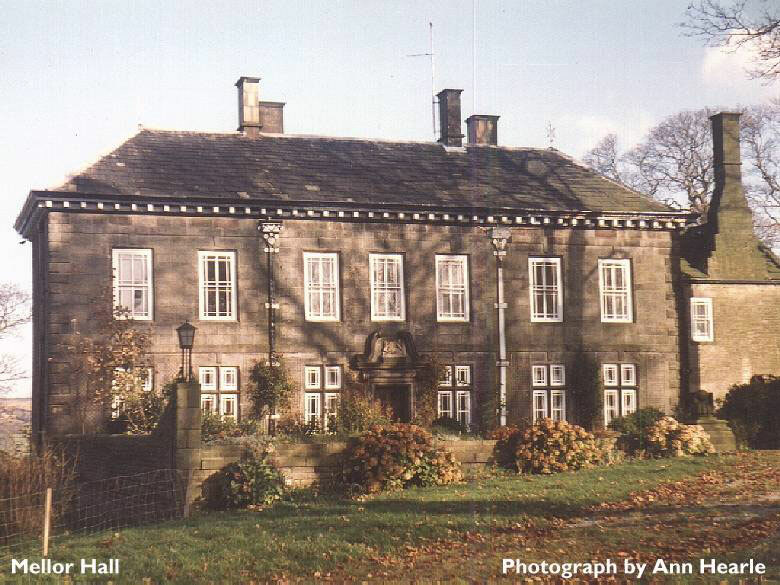 At sometime therefore the Lords of the Manor of Mellor decided to build their new Manor House on a different site. It was not until 2006 that excavation discovered the position of this original manor, revealing the postpits of the Medieval Aisled Hall and associated Medieval Pottery from that period, right beside the Church, in the grounds of what became the Church Inn and Eventually the Old Vicarage. The centre of the Medieval Hamlet of Mellor was indeed found to be the busy crossroads on the hilltop. The practice of gradually Assarting areas of the forest was greatly accelerated when Charles the First, finding himself on the brink of Civil War, needed urgent finance. He hoped to raise it by freeing the land from Forest Law and dividing the commons and wastes between freeholders and tenants and the King, enabling him to sell his part off to raise funds. Being so dependant on the practice of intercommoning, there was inevitably huge resistance and disputes dragged on for decades until the early 17th century. 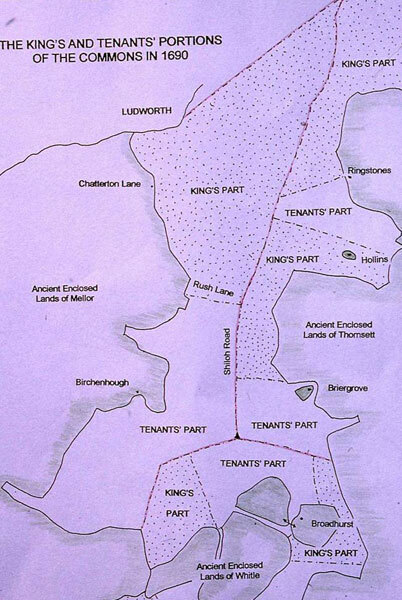 The commons north of Rush Lane went to the King and an equal area remained with the tenants and freeholders. Shiloh Road was the new road laid out for access, following the Mellor and Thornsett boundary. 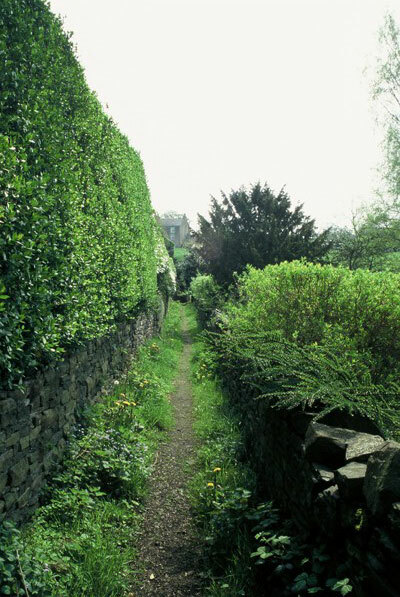 By the OS survey of 1898 new farms had been established and were subdivided by dry stone wall boundaries, apart form Shiloh which retained hedges, portions of which can still be seen on western side in some parts of Shiloh Road. 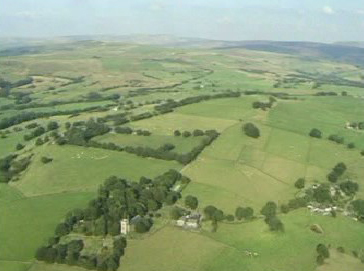 In early post glacial period the Pennine fringe was clothed in deciduous forest producing brown earth soils. Clearance of woodland for cultivation and pastoral farming modified the soil forming process. The regime of grazing and lack of woodland cover encouraged peat formation on the formerly unenclosed commons above 800ft. The pattern of fields and dry stone walls resulting from the enclosure of the commons gradually changed the nature and appearance of the land. The domestic textile industry was industrialised with the development of Water power and the ready supply of fast flowing water in steep sided valleys of the tributary streams feeding the River Goyt. The coal seams which encircles the summit of Cobden Edge and occur near the surface at Birchenough and Mellor Moor became economically significant and their output was substantial during the early 19th Century when the textile industry changed to Steam Power. Flooding remained constant problem however and eventually led to their closure around 1879. The settlement patterns of the valleys was profoundly affected by these industrial developments from the mid to late 18th century, when an alternative employment became available instead of farming and houses were clustered in smaller plots around the Mills to provide accommodation for the workers and their families.